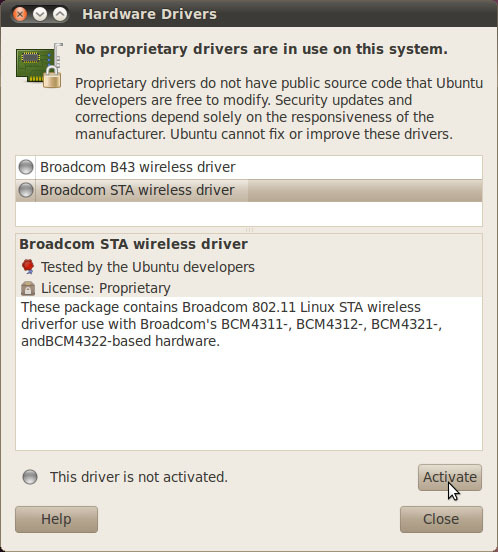 Ubuntu Linux doesn't automatically support HP mini 210 Broadcom b43 wireless card. You can check your wireless card details by going to the Terminal and type lspci or sudo lshw -c network. If your netbook is using Broadcom b43 wireless hardware, simply plug in LAN cable to the netbook and go to System > Administration > Hardware Drivers. Ubuntu will starts to scan your netbook hardware and shows you 2 types of wireless driver that you can activate, B43 and STA. Choose Broadcom STA wireless driver to activate. When the activation is complete, restart the netbook and the Broadcom wireless card will works without flaw.